Social Referrals™ is a revolutionary, unique, patented, social media application exclusively designed with today’s social media savvy business in mind. Social Referrals™ is a complete internet marketing solution that grows your business through viral social deal sharing, online appointment and contact management, email and text message marketing, analytics and much more. Social Referrals™ uses deal sharing to create revenue generating referrals which effectively and efficiently increase your business's bottom line and it's brand’s awareness. This unique application encourages customers to share your business and latest promotion with their social network, on any device, anytime, anywhere.! 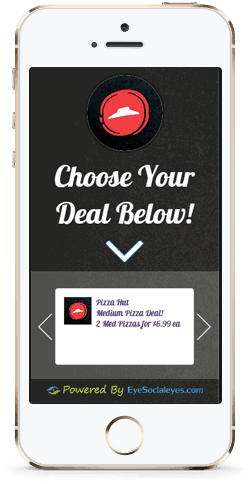 Ramp up your business's referrals using our patented deal sharing technology and watch your customer base grow exponentially! As your referrals grow so does the revenue they bring to your business! Social Referrals™ is also extremely cost effective lowering your advertising costs and increasing your profits. Your business's image is everything. Increase and protect your businesses brand awareness at the same time. Social Referrals™ creates a viral referral network that spreads your business's message while controlling the content to ensure consistency and accuracy. Voila! Marketing your business has never been this easy before. Social Referrals™ is so easy to setup, customize and use that it only takes a few minutes until your business is a well oiled marketing machine! Engage customers through continuous exchanges of value. Social Referrals™ drives a recurring cycle of engagement - attracting, selling and supporting your customers to incrementally accrue value and trust.